My husband and I love hiking, camping, and all kinds of outdoor activities. However, we live in Florida and it gets pretty hot here in the summer. We tend to slow our outdoor activities down a bit starting in mid June until the temperatures reach reasonable numbers again (we especially avoid 3 digit numbers). Even though it's still hot here, we're starting to gear up for the fall camping season. So I thought I might share some tips for campfire cooking, and a few of my favorite recipes. I tend to prefer to stick to simple meals when I camp, less clean-up and more time enjoying nature is a good thing. I actually prep (and in some cases even pre-cook) most of our meals the week before our trip. One of my favorite things to make are foil packets. You literally chop up a bunch of vegetables and/or meat, add in a it of butter/oil and some seasonings, and wrap them up in foil (make sure to close your packets on the top so the juices don't leak out into the fire). Now, if you don't want to deal with the waste, you can always just pack up the chopped vegetables and sautee them in a pan. But I often have to deal with picky eaters and foil packets are a bit more customizable. If person A doesn't like beets, but person B loves them, you can easily make them separate meals. Or if person C is the only vegan in the group, you can easily make all their food vegan friendly while not making the others have to worry about it. Foil packets are also super easy to cook in just about any situation. 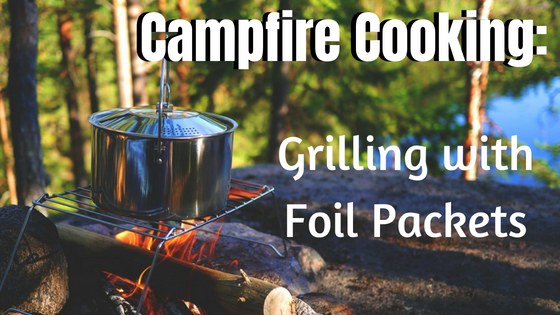 If there's a fire ban because of drought conditions, you can still cook the foil packets in a camp oven or in a pot on the camp stove. Oops, you forgot to pack your campfire grill? No problem, put the foil packets next to the fire (or directly on top of the embers) and they'll cook just fine! While you can put whatever ingredients you want into your packets, I figured I'd share a few of my favorite recipes with you guys. 1. This is a great breakfast idea, and can be made gluten free and vegan friendly by using GF bread and coconut milk. This one is not good to make completely ahead of time, but you can prepare the dry ingredients in foil packets, mix the wet ingredients in a different container and just add the wet ingredients to each packet at your campsite. This recipe makes 3 adult servings (or 2 adults and 2 kids). Combine the first 7 ingredients in a blender and blend well. Store in a seal-able container (one that has portions on the side makes cooking much easier at camp) in your cooler. Cut up the bread into ½ inch cubes. Portion the cubes, and blueberries, equally into 3 foil squares. Seal the squares on the sides and top, but make sure you can open the top again at camp. When you are ready to cook them, open the packets and pour in the wet mixture, evenly into the 3 packets. Carefully stir the mixture in each packet and close them up. Allow the packets to rest for about 5 minutes before cooking. They take 25-35 minutes to cook. Don't place them on direct heat or you will burn the bottom. You also don't have to flip them as long as the packets are sealed well. Remove them from the heat and enjoy! * You can also try this recipe using any fruit you want, try sliced bananas or strawberries for a different treat! 2. I grew up eating these as often as my dad would make them. They're super great in an oven, but they're best over an open fire, not to mention they're really easy to make. Make them ahead of time to save on prep, or make them at your campsite. Peel the onions, leaving the root ends intact. Cut a thin slice from the top of each onion and cut a small hole in each. Cut into quarters, leaving the bottom ½ inch uncut. Place each onion on a square of foil and drizzle olive oil, and sprinkle salt and pepper, into the center of the onions. If desired, also drizzle wine, broth, or beer into the holes. Close up the foil packet tightly. Grill over indirect heat for 45 minutes. 3. This recipe is great for all the vegan's in the camp. It's also super versatile, try adding in some tempeh or chicken. Or maybe try changing up the veggies a bit (add some hot peppers or take out the corn and add 1 cup of chick peas instead). Place all ingredients in a large mixing bowl and give it a good toss. Divide the mixture equally between 4 pieces of foil. Close up the foil and place over indirect heat for about 10 minutes, or until the potatoes are fork tender. Enjoy! 4. This is a crowd-pleasing dessert, and it's super easy and fast. You don't need to prepare this ahead of time. For added fun, try bringing other toppings (marshmallows, blueberries, strawberries, trail mix, granola, etc) and let everyone stuff their own bananas. If you don't have a grill for over your fire, place these babies next to the fire, or in the embers for about 7-8 minutes (or until they're nice and gooey). Place bananas on a 12-inch square of foil, shaping the foil around the bananas to help them sit flat. Cut each banana lengthwise, about ½ inch deep, leaving ½ inch on each end uncut. Gently pull the bananas open, creating a pocket. Drizzle a little honey into the pockets and fill with chocolate and nuts. Gently wrap foil around the bananas, closing the packets. Grill them for around 5 minutes. In any of these recipes, feel free to change the ingredients around. Play with different herbs, veggies, and fruits. Have fun, play around, and let me know what you think below!